The phrase "there are no words" is used to describe something so outlandish that it's better to let the situation explain itself. 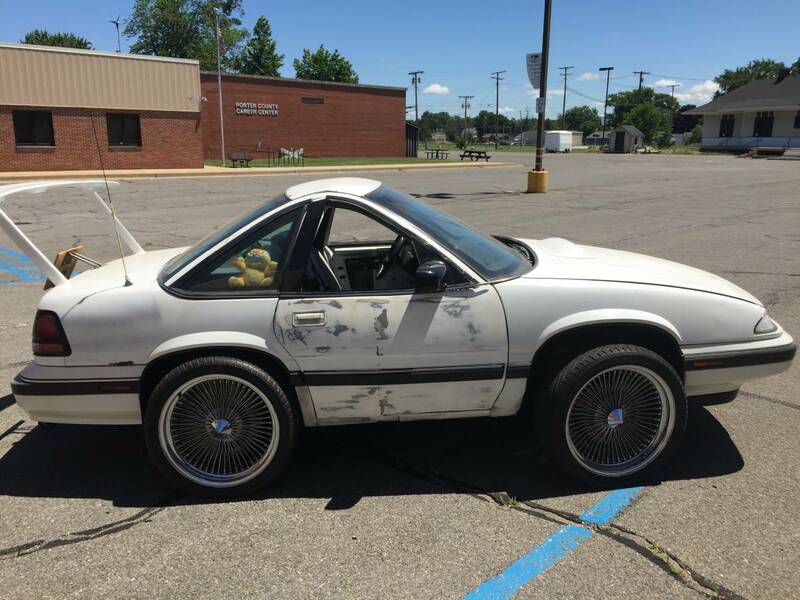 In the case of this 1991 Pontiac Grand Prix for sale on Chicago's Craigslist, there are words. In fact, there are many words to describe this car. So many that we don't quite know where to begin. Let's start with the listing itself. It doesn't have a lot of information, but it touches on the important points. "One of a kind 1991 Pontiac Grand Prix. This car was an original 4dr that has been cut and sectioned. Runs and drives. Needs some finish work. 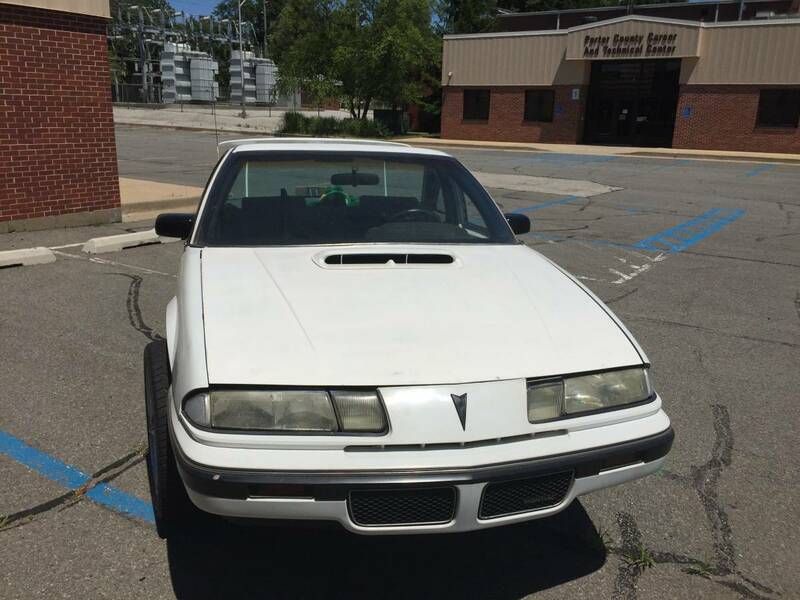 $1500"
Yes, this Grand Prix is "one of a kind" and could use "some finish work," which could be the automotive understatement of the year. Maybe they meant to say "some parts don't need finish work, most do." 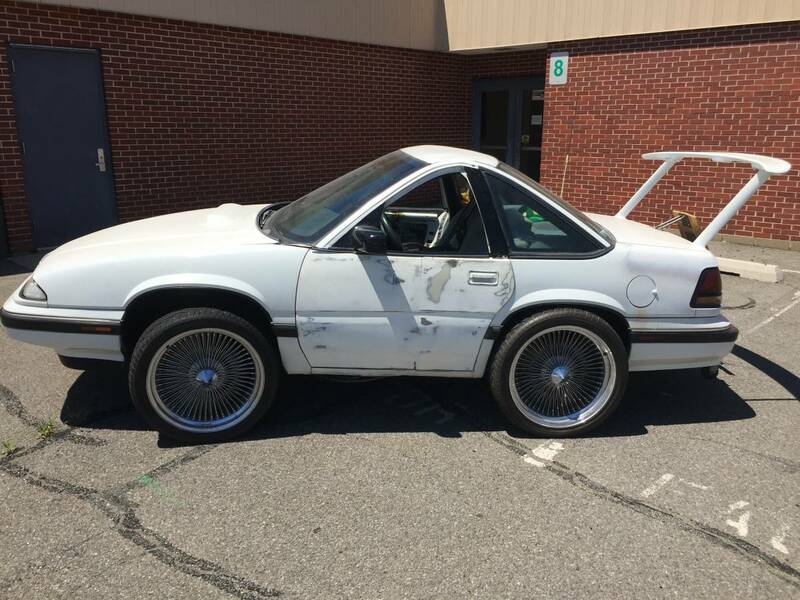 Being a 1991 Grand Prix, the parts that don't need "finish work" probably need regular work. I had the displeasure of driving one of these in 1998. It was a loaner while my truck was in the shop. As a car, it had no redeeming qualities. At seven years old, it already needed regular work on everything. It didn't even last the loan duration. One can only imagine the horrors that await you in this 26-year-old, shortened wheelbase version. This car has been cut into three sections. The middle section is gone, and the front and rear portions now connected. If you look carefully at the doors, you'll notice they are made from half of a front door and half of a rear door. I have serious doubts about their structural integrity. For that matter, it'd be wise to doubt the structural integrity of the entire car. The roof is virtually gone, as is the b-pillar. Who knows what condition the frame is in. Prospective buyers should have a gander at the welds. This half-off Grand Prix probably handles as well as an Ikea shopping cart. By removing this much car, the owner need to shorten the exhaust, fuel line, brake lines, part of the wiring harness, and anything else that goes from the front to the rear of the car. Best case scenario? They ran new brake and fuel lines while carefully and meticulously cutting and splicing each electrical wire. The best case scenario is doubtful. Thankfully, the Grand Prix is a front-wheel-drive car. That is just one less thing that could have gone wrong while being chopped into pieces. Of course, everything that can go wrong with the engine and transmission of this car probably already has, by nature of it being a 1991 Grand Prix. The rear is its own tragedy, separate from the disastrous chop-job. The last time I checked, this car is not Richard Petty's 1970 Superbird, so that rear wing needs a talking to. Below the wing, there is a weird piece of plywood mounted on the trunk. What that is, I have no idea, Below that, a set of small wheels protrudes out from the bottom of the car. Is that to keep it from flipping over? The rear-end does sit rather low, which brings us to the oversized wheels. Are they needed, especially on the front, because normal wheels would be lifted off the ground due to the low-riding rear? And why does the rear ride so low? 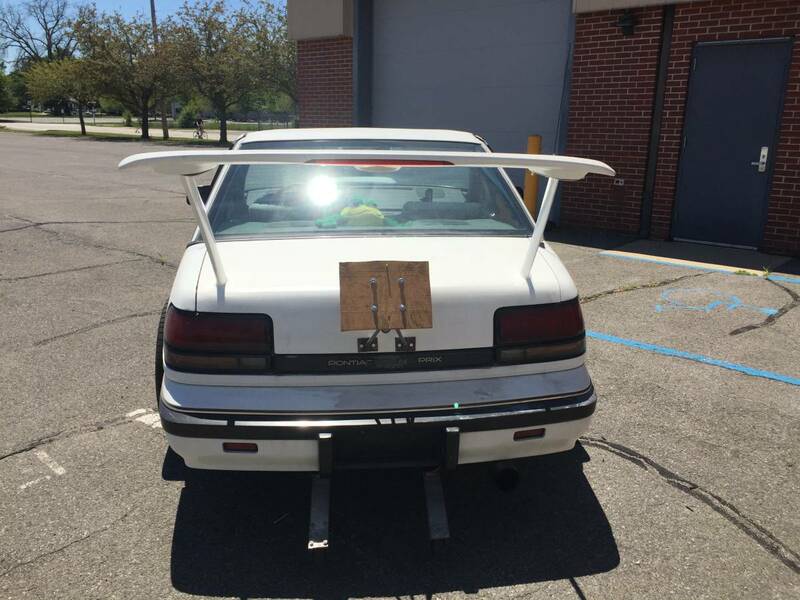 Maybe that wing produces 4,000 lb of downforce when at a standstill? Chopping a car in half to either short or lengthen it is a big undertaking. Normally, lots of carefully laid plans are executed with precision. Through some very quick work in Photoshop, I think I have replicated the plans for this custom ride. The result is about the same as the real thing. Is $1,500 too mush of an ask for this "one of a kind" whip? If I lived anywhere near to Chicago, it would be already be sitting in my driveway. 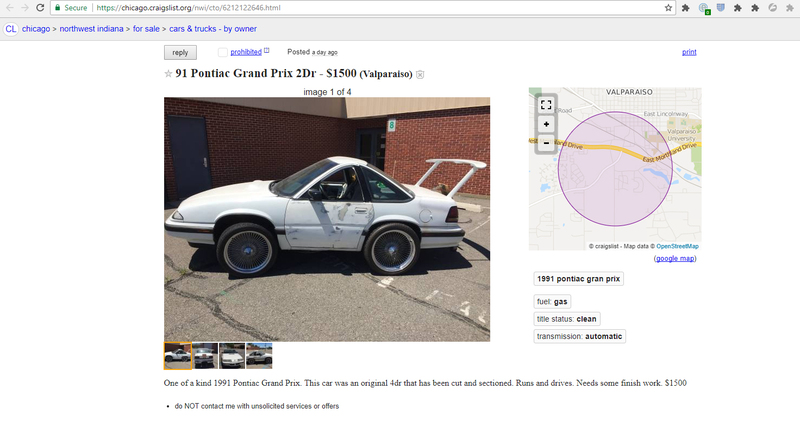 One more point, this Grand Prix might be the ugliest car found on Craigslist. What do you think?